What happens when two Thai young people who both have a heart to teach the Word of God get married? A School of Biblical Studies (SBS) is born! King was born in the South of Thailand but grew up in Bangkok. Although he was born into a Christian family, it wasn’t until college that he really accepted Jesus to be his Lord. In 1999, he attended a DTS in Los Angeles (USA) and it was there that God revealed his life’s calling which was to teach the Bible. Apple was born in the North of Thailand (Chiang Mai) into a Chinese-Buddhist family. Her parents were angry when she became a Christian in 1992. Following graduation from university in 1996, God opened the door for her to serve full time with YWAM’s English Center in Chiang Mai. During this time, God also worked in her parents’ hearts and they supported her to go Montana to do her DTS in 1998. After DTS, Apple returned and continued to serve in the same ministry. 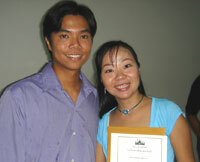 After King completed his DTS, God led him to work at the YWAM English Center in Chiang Mai also. There he met Apple and they worked together for one year as good friends and co-workers. In 2001, King attended a SBS in Montana, which deeply impacted his life. Immediately, he had a burden to start a SBS in Thailand but first he worked as SBS staff in Montana for two years. During this time, Apple spent three years in the Philippines studying towards a Master of Divinity degree. Her heart was also to teach the Bible to the Thai people. In 2004, God led both King and Apple back to Thailand. When they met each other again, they felt that it was God’s plan and time to get married which they did in February of 2005 in Chiang Mai. A few months later, they decided to move to Southern Thailand (Phang Nga) where they met up with two good friends who also had a heart to start a SBS. After praying and talking, they felt that Phang Ngawould be a good location to host these schools. The first New Testament School of Biblical Studies (SBS) in Thailand was completed in March 2006 with eight students attending. We were so blessed to see how this school really prepared those who attended for the work that they would do in the future. It was exciting to see how knowing more of God’s truth gave them more confidence to do whatever God was calling them to do. Since we saw a real weakness in the body of Christ in Thailand with regards to understanding God’s Word, the goal of our SBS was to equip Thai ministers in the Bible so that they would fulfill what God called them to do effectively. We were excited that this goal was accomplished. Currently, we are offering only a New Testament SBS (4-month course). Our goal is that in a few years time, we will be able to lead a SBS covering the entire Bible (9-month course). If you feel like you want to know the Bible better so that you can pass it on to other people, please come and join us! Your life will never be the same as God’s Word changes you, and in turn, impacts those around you.